“The Disgrace of Wolsey” by Henry Monro, 1813. © Tate Collection. Presented by Mrs. Elizabeth Bowlby. Image released under Creative Commons CC-BY-NC-ND (3.0 Unported). A true student of history learns from the lessons of the past, to understand the present and chart a course for the future. To grasp the present crisis inside the Church, a look at past episodes in history is essential. There are many lessons to be found in the timely appearance of a 1954 book reprint titled The English Reformation by Fr. Gerard Culkin. Like so many other precious pearls, this small volume would have remained hidden from the public. However, editor Mike Church took the book, corrected text, added details to footnotes, provided drawings and painstakingly reproduced the work for today’s reader. The merit of the work is that it is a short yet gripping account of this turbulent period of English Catholic Church history. The reader follows the process of England’s break with Rome and entry into heresy. The narrative has familiar parts that reflect fallen human nature. It also has heroic episodes in which martyrs defied the spirit of the times and entered into history. There are excellent lessons that can be learned from a quick reading of this 150-page work. The first is that “reformation” is rarely reformation; it is merely the excuse for revolution. Revolutionaries almost always use real problems that need reform, however they have no desire to see these problems resolved, but use the turmoil to advance their own purposes. Additionally, although the initial motives of “reformation” usually involve power and greed, they quickly degenerate into a revolt against the established order. The lives of those who benefit from these revolts, such as Henry VIII, Cromwell and Cranmer, usually end badly. Another lesson to be learned is that such revolts rarely come from the people. The English Reformation was a top-down revolution that trod upon people’s rights. The author shows how, during a good part of the “reformation” process, great care was taken not to change too much inside the Church. In fact, the majority of the people were unaware or indifferent to what was happening around them. 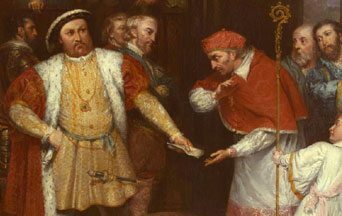 This top-down revolution was not met by a reaction among the bishops and clergy who, with notable exceptions, failed to resist the takeover of the Church by Henry VIII and his agents. The course of history is indeed determined by impassioned minorities, either of good or evil. 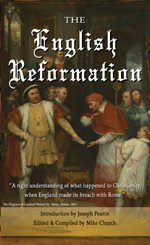 In the case of the English Reformation, the book shows that good was outmaneuvered by a well-organized evil minority. Finally, there is an encouraging lesson from this tragic tale. The reader is heartened to see that God does not abandon His Church. When it seemed the Reformation had triumphed, the author shows how God raised up courageous priests and laymen to keep the Church alive and add to the glory of the martyrs. The inspiring stories of Father Edmund Campion or Saint Margaret of Clitherow are examples of martyrs who defeated the determination of the Church’s enemies to destroy all vestiges of the Catholic religion in England. Their example inspired others to hold on to the Faith. There are many other lessons in this short book that serve to teach and edify today’s Catholics. Editor Mike Church is to be commended for bringing this jewel back from obscurity. This entry was posted in TFP Recommends Books and tagged Catholic Church, English Reformation, history, Martyrs by John Horvat II. Bookmark the permalink.